"If Time's cutting-edgers wanted to be really subversive … they might've found room for a small but growing grass-roots movement to collect that elusive evidence in our own atmosphere." Ever notice all those special-niche impulse-buy glossies larding the supermarket magazine sections? Items like Newsweek’s “Jesus” and “Lincoln” editions, Time’s “Mark Twain”? How do these things make money — massive personnel layoffs? They’re slicky produced and have few, if any, ads. 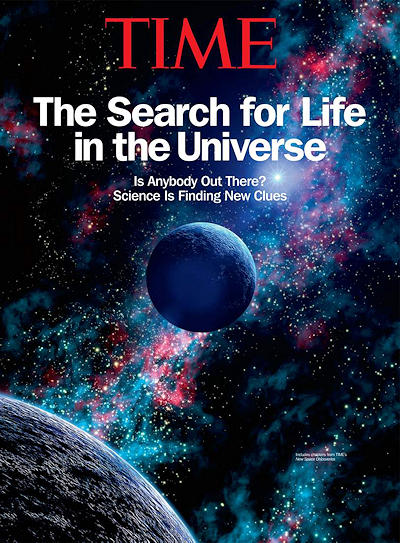 The other day, just for the sheer dispiriting hell of it, De Void picked up a copy of Time’s “The Search for Life in the Universe,” at $14 a sizeable sum for product that, according to the stack on the rack, wasn’t exactly flying off the shelves. The "New Clues" included extensive copy devoted to SETI, which has been failing to detect alien signals for only 55 years now; a look at deep-space telescopes (who knew there were such things? ); a review of the 20-year-old transiting techniques astronomers are employing to confirm a growing harvest of extrasolar planets; decades-long efforts to draw theoretical corollaries between Earth’s microbial “extremophiles” and life in hostile off-world environments; plus discussions of our potential ET roots facilitated by organic compounds embedded in asteroids. Those panspermia debates have only been underway since the 1970s. Um, learned men like who? Whom? SETI is so mainstream, it first procured federal funding in the 1980s. And just last summer, Shostak appeared before a Congressional committee to request more cash. Did the Time editors miss the Jodi Foster film “Contact,” which pretty much muted with the giggle-factor in 1998? Did they miss the PBS treatment in 1999? How about NOVA's "Learning Media" spinoff (suitable for grades 6-12) featuring Neil deGrasse Tyson in 2004? If Time's cutting-edgers wanted to be really subversive and go off-road for “New Clues” (which they don’t; they're too busy trying to think outside the box), they might've found room for a small but growing grass-roots movement to collect that elusive evidence in our own atmosphere. Thanks to evolving and accessible technologies, regular folks are getting eager to navigate around institutional timidity and conduct science without waiting for approval by the learned men. Take Project Connecting Evidence, for instance. First unveiled early this year, PCE’s “UFO detector” offers free downloadable software which, with an assist from a USB webcam, can automatically trigger recording modes — no operators necessary — if it detects what it determines is anomalous airborne movement. Leave your laptop running and, presto, no more hand-held jiggles. Clearly, the catch is determining what constitutes anamalous airborne movement. The brains behind PCE — a German software developer who prefers to identify himself solely as “Rust” — cautions that users will encounter the beta version, and that he’s working out the detection algorithm bugs, literally, right now. He’s asking users to send him false positives like bugs, birds, bats, etc., in order to make those adjustments. And with myriad apps tracking satellite flyovers and websites like Flight Radar 24 posting archived and near real-time transponder air traffic, PCE operators already have the means to eliminate broad categories of junk suspects. At a recent Florida MUFON gathering near Tampa, volunteer officers announced plans to deploy cameras patterned on New Mexico State University’s “sky sentinel” project, which charts atmospheric movements, like meteors, to assist satellite operators in separating man-made from natural clutter. Tampa Bay state section director Bill Schroeder, an Army veteran who once had a harrowing on-duty radar encounter with a UFO, predicted the envisioned horizon-to-horizon wide-angle camera network would be “the finest UFO detection system in the world.” Theoretically, once in place, the MUFON Aerial Surveillance Team would notify logged-in network members statewide of UFO activity that might be headed in their direction. Crowdfunding is anticipated for all-sky cams and software that can assess trajectory, speed, distance traveled, and other flight characteristics of selected targets. Again, existing website data can eliminate satellite, astronomical and conventional aircraft. The most revolutionary stuff, of course, is being developed by Hollywood special effects pioneer Douglas Trumbull. Architect of what he calls “immersive” media, Trumbull’s groundbreaking 2014 short, “UFOTOG,” showcased 3D footage shot at 120 frames per second, four times the industry standard. Trumbull’s team hopes not only to aim his multi-spectrum lenses at UFOs in the sky, but also to record anomalies in the ocean as well. Hmm. This sounds kind of interesting. Maybe, in another decade or so, with a little Time's next "Are We Alone?" special edition might devote a few paragraphs to it.